Television royalty came to Wootton on May 18th when Esther Rantzen, one of the country’s most admired broadcasters, spoke about her career and gave an insight into the many outstanding campaigns she has been involved with over the past 35 years. Far from slowing down, Esther detailed her latest venture – a charity called Silverline which is aimed at tackling loneliness and isolation and freeing thousands of elderly people from the “prison of suffering” It is intended to use the same model as ChildLine , the charity aimed at addressing child abuse. As well as providing facilities for a friendly chat, it will also be a free and anonymous whistle-blowing service for people to report neglect and cruelty. Esther, 71, was moved to set up the charity after returning home one night to her flat in London, where she lives alone, and admitting to herself that she was lonely – and that there must be many others in the same boat. She describes the new charity as a “ChildLine for older people”. Esther told us that she plans to work with the Centre for Social Justice, the Campaign to End Loneliness and the Department of Health. She has taken advice from experts on befriending and the care of older people, as well as taking advice from those at ChildLine. The planned telephone line will have no age limits and people will be able to ring for information, friendship, help with health worries or for financial guidance – and it will signpost people to other organizations that can provide support. She also reflected on her iconic BBC programme, That’s Life!, which ran for over 20 years and often attracted audiences of over 18 million. One of the children it highlighted was Ben Hardwick, a toddler who was given an urgent liver transplant and – although Ben only lived for a further year – it prompted major advances in organ donation. However, another child – also called Hardwick, but no relation – received a new liver at about the same time and he is still flourishing, having attended university and is on course for a full and varied life. But the evening was far from maudlin and Esther recounted some wonderful anecdotes from her days at the BBC, including the time Michael Parkinson asked the singer Dolly Parton how long it took to prepare her hair. “I’ve no idea,” replied Dolly. “I’m never there”. She also recalled the early days when she joined the BBC as a sound-effects assistant and one of her tasks was to create the sound of a pterodactyl flying away. Using a borrowed umbrella in the village hall, she showed that opening and closing it can sound (in theory) like the wings of the prehistoric animal. In those days, hardly any women appeared on screen and discussions even took place at the highest level within the BBC on whether a woman had the gravitas to read the news on air. Marlene Fisher, our regular back-drop designer, was indisposed and so Vee Colditz and her friend, Lindsay Harris, stepped into the breach with a magnificent creation, depicting the iconic That's Life! logo. Over 145 people packed the hall and generated proceeds of £891. 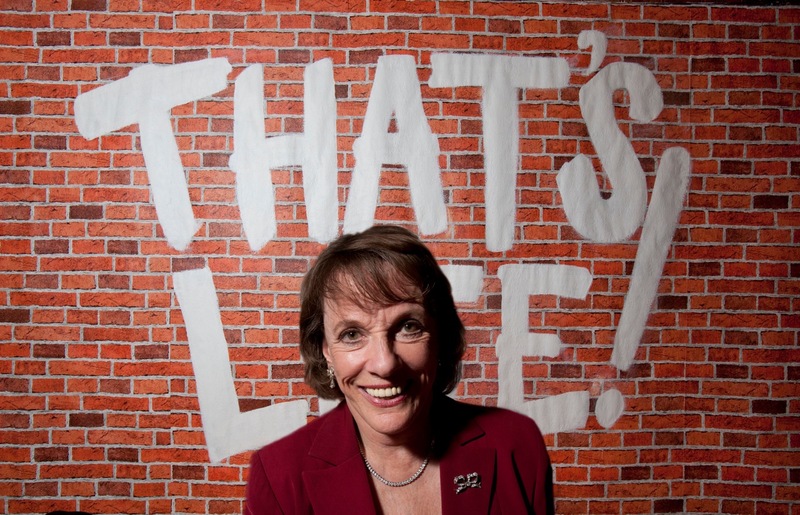 “Esther Rantzen proved that she is one of the country’s greatest campaigners on many issues and has forced changes in legislation in several areas, as well as improving the lives of countless people through establishing support networks. She is a wonderful communicator – and her hilarious anecdotes about life in television were also recounted with precision comedic timing. Everybody in the audience was utterly inspired by her tremendous energy and commitment – David Keene, Milton Keynes"